Darling Homes debuts the City Collection featuring open-concept living rooms, filled with natural light, thoughtfully transition to breakfast areas and gourmet kitchens, while second-floor game rooms situated in lofted spaces offer views of the first floor. HOUSTON, Nov. 15, 2018 /PRNewswire/ -- Built for luxury living on the go, Darling Homes is now selling its new City Collection of urban homes in select Houston and Dallas communities. The City Collection offers homebuyers timeless designs in homes that are lock and leave ready while offering suburban comfort in an urban setting. Homes are designed with architectural authenticity and are built in communities that give residents convenient access to an active lifestyle. "These homes give residents the opportunity to be a part of lively, bustling communities with shopping, dining and entertainment options just beyond the front door," said Charlie Enochs, area president for Taylor Morrison and Darling Homes. "This collection gives Darling homebuyers upscale, urban homes that are sophisticated yet easy to maintain." Covered front porches and courtyards help to create a unique and distinctive streetscape lined with traditional, Mediterranean, Craftsman, International, modern as well as several additional elevation options. The two-story floorplans range from approximately 2,200 to 2,600 square feet of living space. Open-concept living rooms, filled with natural light, thoughtfully transition to breakfast areas and gourmet kitchens, while second-floor game rooms situated in lofted spaces offer views of the first floor. Private studies, master suites with walk-in closets and spacious bedrooms create homes that leave a lasting impression. Outside, private courtyards add to the experience of the homes, which feature a zero-lot line. The City Collection by Darling Homes is currently available in the Houston communities of Imperial and Avalon at Sienna Plantation. In Dallas, the homes can be found in Canals at Grand Park, Montgomery Farm Angel Field East and coming soon, The Terraces at Las Colinas. For more information on Darling Homes, please visit www.darlinghomes.com. Taylor Morrison Home Corporation (NYSE:TMHC) is a leading national homebuilder and developer that has been recognized as the 2016, 2017 and 2018 America's Most Trusted® Home Builder by Lifestory Research. Based in Scottsdale, Ariz., we operate under two well-established brands, Taylor Morrison and Darling Homes. We serve a wide array of consumer groups from coast to coast, including first-time, move-up, luxury, and 55 plus buyers. In Texas, Darling Homes builds communities with a focus on individuality and distinctive detail while delivering on the Taylor Morrison standard of excellence. 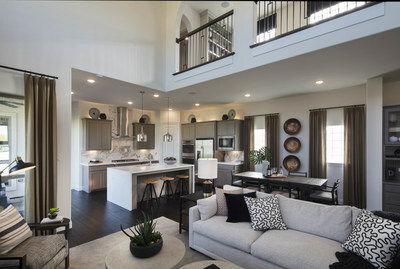 For more information about Taylor Morrison and Darling Homes please visit www.taylormorrison.com or www.darlinghomes.com.